When Sculpting Cedar, This Artist Is Tireless And Unsentimental Ursula von Rydingsvard is 70 years old, but she still spends eight hours a day working massive blocks of cedar into sculptures. "I don't want the cuteness associated with the wood," she says, "or even the nostalgia." 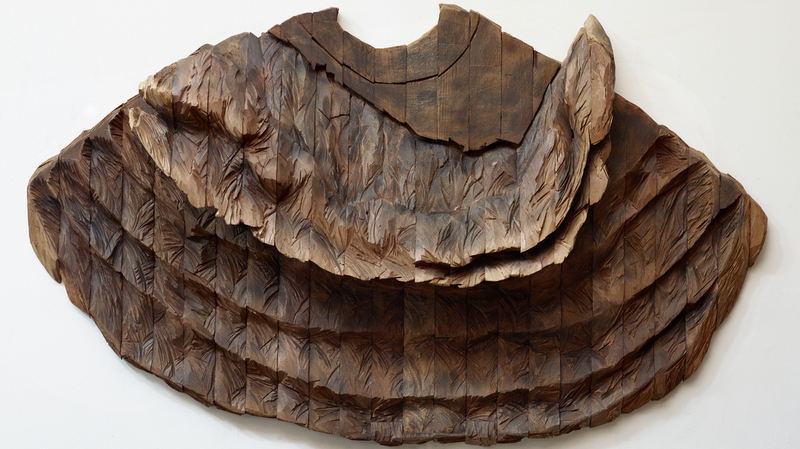 Ursula von Rydingsvard's Oddychajaca is currently on view in Manhattan at the Museum of Art and Design's exhibit "Against the Grain." "I don't want the cuteness associated with the wood," she says, "or even the nostalgia." 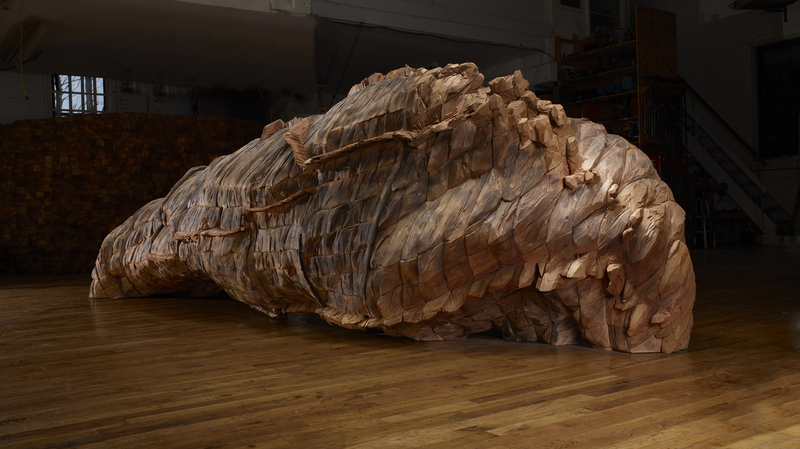 Ursula von Rydingsvard makes huge sculptures out of red cedar. The 70-year-old is one of the few women working in wood on such a scale. Her pieces are in the permanent collections of New York's Metropolitan Museum of Art and Museum of Modern Art. And now they're also part of a new show at Manhattan's Museum of Arts and Design. It's called "Against the Grain" — a phrase that could just as well describe the sculptor's life and career. Luba, 2010. Cedar, graphite, bronze. 212" x 139" x 88". Von Rydingsvard says she wants to break people's sentimental attachment to wood, "which is, you know, in the land of the elves or in a storybook for children," she says. "I don't want the cuteness associated with the wood, or even the nostalgia." Von Rydingsvard seems to have little reverence for the medium, but nostalgia is another matter. She was born 70 years ago in Germany, and recounts in vivid detail the stories of her Polish mother and Ukranian father. He had been been conscripted to work on a German farm during World War II, and after a couple of years he sent for his wife. "Trains were burning, and she had three little children, the youngest of which was 2 and a half, 3," she says. "Two of them almost died on the way." When the war was over, her father didn't want his children to grow up semi-literate, on a farm, so the whole family embarked on an arduous journey that lasted several years. "We went through something like nine displaced-persons camps for Polish people," von Rydingsvard remembers. "We couldn't go back to Poland — it was communist — so we kept going from one camp to another." Finally, they were allowed to go to America, to a small town in Connecticut. Ocean Voices, 2012. Cedar, graphite. 53" x 185" x 67". "I'm not a Pole, but identify myself as a Pole; I feel like an outsider here in the United States still, if one can believe it," she says. "I was never in Poland until I got to be an adult, so my idea of what was Polish is totally a fantasy, fabricated in my head. But it's in my blood, and all that stuff about farming is also in my blood, and I would like to shake it but I can't seem to." 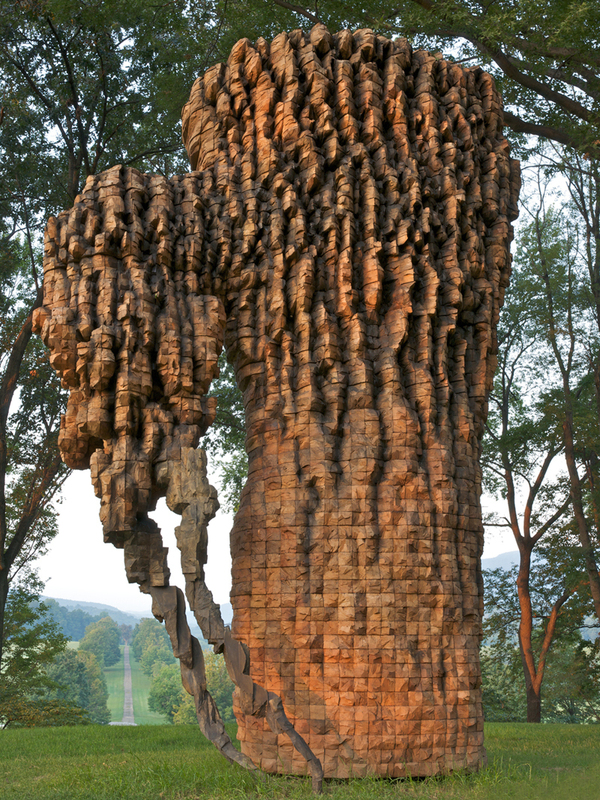 Ursula von Rydingsvard works massive blocks of cedar into sculptures, like Czara z Babelkami, pictured here. 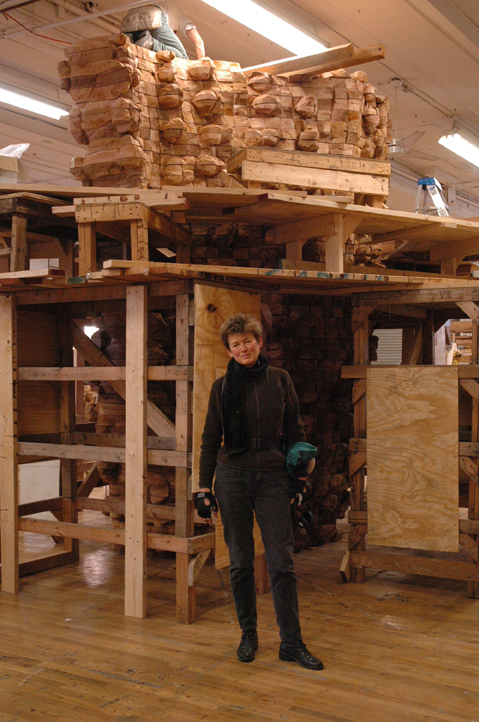 There's something else Ursula von Rydingsvard can't shake: cedar, the material she's been using for nearly 35 years. Using circular saws and chisels, she and her assistants carve and chip cedar 4-by-4's that she gets shipped from Vancouver. She says that unlike other wood, there's virtually no visible grain to cedar. It's "neutral; it's like a piece of paper," she says. "It really says nothing in and of itself — so it then enables me to really sort of tear it apart and make it do the acrobatics that I need it to do." She has no use for a beautifully crafted coffee table made from a slice of tree — von Rydingsvard rubs her cedar sculptures with graphite to further obscure their woodiness. "It's the opposite of what you'd expect from someone carving in wood," says Museum of Art and Design curator Lowery Stokes Sims. As you would expect, von Rydingsvard's studio is full of wood: towering layers of nibbled cedar. She stands amid them, tall and slender, dressed in black jeans and layers of black tops. I feel the fact that I'm a woman has influenced the look of my work. But I dread the thought of it being thought of as work that could only belong to a woman, that it doesn't have the strength of what was usually thought of as the men's work. One of her pieces touches the ground, sensuously working up and out like a caterpillar out of Alice in Wonderland. In everything, there are pouches, pockets for hiding, warrens for squirrels and ideas. Spoon and shovel-like forms with handles on a scale fit for Paul Bunyan hang against a wall. Sims says one of the things that distinguishes all of the work is its size. "The scale works wonderfully on the outside," she says. "On the inside, it does sort of really overtake you to a certain extent. You know, you get a kick out of big things made by women. There's a kind of grandeur to her vision and ambition to her work, which is still in 2013 unexpected on the part of a woman." "I definitely feel like a woman; I feel the fact that I'm a woman has influenced the look of my work," says von Rydingsvard. "But I dread the thought of it being thought of as work that could only belong to a woman, that it doesn't have the strength of what was usually thought of as the men's work." Von Rydingsvard has to be strong to do what she does — not only to muscle around those big chunks of wood, but also because after all these years, she's become allergic to the cedar. She has to wear a 15-pound suit with air pumped into it for as many as eight hours a day — but she won't give up her ties to her past, and she certainly won't give up her cedar.